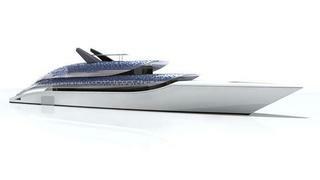 The De Voogt Breathe concept uses black-and-white stripes to create air flow across its decks and superstructure. Is it possible for a large motor yacht with minibus-size internal combustion engines to legitimately be called green, or is the green revolution in yachting just media and marketing hype meant to prey on the guilt of environmentally conscious owners, or assuage the suspicions of some segments of the general public and regulators who see the sport as a wasteful recreational pastime of the affluent? The likely answer is yes and no. What is undeniable is that marine engines and systems are gradually becoming more efficient, and thus, greener. With fuel costs ever rising, governments cracking down on emissions and owners becoming more sensitive to the impact their yachts have on the fragile ocean environment, designers, engineers and power plant manufacturers are beginning to employ novel approaches to improving the efficiency of existing marine power and explore new angles on alternative fuels. If not so much a green revolution, we are at least seeing a green evolution. Perhaps no more familiar visual symbol of eco-friendliness exists than the recycling logo of three canted arrows arranged in a triangle. Few are aware, however, of the meaning behind the symbol, particularly that recycling is the last and least important step in going green. The three arrows in the logo represent Reduce, Reuse, Recycle, and the order is deliberate. Being green starts with reducing our waste of products, materials and energy  a process that should begin long before an owner ever sees his yacht. The owner and his design team, working in conjunction with the builder, are the individuals who can have the greatest and longest-lasting effects, simply by making the reduction of waste a priority. Sparkman & Stephens, one of the most venerable American design firms, is on the cutting edge in this regard. Their designs are now conceived with low-impact construction in mind, and include procedures for incorporating the building frames as part of the yachts structure, rather than using separate jigs that are later scrapped. Not only does this reduce the amount of material used initially and the amount that is thrown away, it can also reduce initial costs in some cases. Yacht builders and their subcontractors, such as the Dutch engineering firm Vripack, have almost universally adopted nesting techniques to get the greatest number of parts from a given sheet of steel, aluminium or wood. Computers are used to plan how to cut parts from a sheet of metal or wood, to maximise the amount of the material used. The resulting pattern uses as much of a sheet of material as possible, with the remainder often looking like a piece of lace filigree. Even that isnt wasted, as steel and aluminium are easily recycled, and wood scrap often finds other uses around a shipyard.